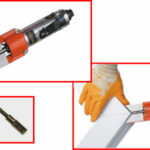 NIS-05 is a pneumatic outer corner cleaning tool. It is easy to use with a specially designed stainless knife. It cleans off welding seams in either hot or cold condition. It can clean the outer corner seams after welding. It has a 22,000 RPM motor, and is featured to cut from end point and side surface. Extra router bits are optional. It can have an inscription of your contact information to give away as a gift. It weighs 0.8 kg (1.8 lb) and measures 8 x 7 x 25 cm (3” x 3” x 10”). It has an air pressure of 6-8 bar (90-120 psi). Cleans off welding seams in hot or cold condition. Cleans outer corner seams after welding. 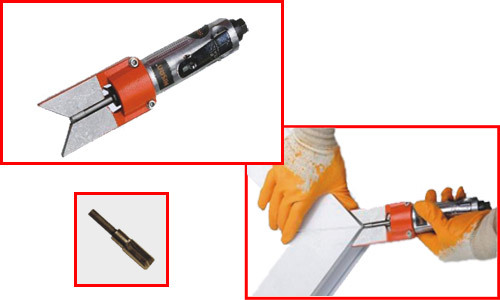 Featured to cut from end point and side surface. Cleans outer sections of the seams very easily.